Tucked away in a hallway on the third floor of the Upstate Cancer Center is a high-tech water filling station, an Elkay EZH2O model, whose popularity is being tested. "It's a pilot to see if people like them," said Tom Pelis, Assistant Vice President for Facilities and Planning, and Chair of the Sustainability Task Force. "It is possible we will put them in the New Academic Building as well." Those aren’t just random rocks behind Tom Pelis and the signage in the circular entrance to Upstate University Hospital and the Upstate Cancer Center. They’re part of a collection and infiltration system that collects 90 percent of storm water from the roofs and surfaces surrounding the Cancer Center. The system releases the runoff slowly to keep it out of the combined sewer system that leads to Onondaga Lake. It is one of three recent “green” projects established at Upstate in partnership with Onondaga County’s Save the Rain program. The Cancer Center entrance installation alone diverts about 1.3 million gallons of storm water per year, said Pelis, Assistant Vice President for Facilities and Planning and Chair of the Sustainability Task Force. Upstate also installed similar Save the Rain measures at Geneva Tower on Harrison St., and the CNY Biotech Accelerator on E. Fayette Street. Those systems collect and divert even more than the million-plus gallons at the Cancer Center, Pelis said. Duplicating can create scrap notepads of 50 or 100 sheets of any size, out of any paper except cardstock. Scrap paper must be in decent shape – no folds, bent corners, or rips and it has to be able to be trimmed to a consistent size (i.e. a box full of paper of all different sizes that can’t be jogged and trimmed will not work.) Send the scrap paper through campus mail or drop it off to Duplicating, along with a ‘Job Card.’ Most of the job card doesn’t need to be filled out; just indicate ‘Scrap pads made with provided paper.’ Indicate desired size (50 or 100 sheets per pad), account number and shipping address. There is a $5 charge for this service. Order may take a few weeks as it is a low priority compared to clinical and academic printing. The scrubs sale will be later this fall, with dates and locations to be announced. Some scrubs that aren’t sold will be donated to the Humane Society or SPCA for employees who work with animals, Martino said. In May 2014, the Department of Environmental Services implemented the Stericycle Sharps Management System. This reusable Sharps container program has multiple benefits – reducing cost, increasing safety with sharps handling, and preventing plastic from entering the landfill. With this program, rather than using a container one time, the containers are emptied, sanitized and reused up to 600 times. Use is tracked by a barcoding system. When it is time to remove the container from service, it is recycled. 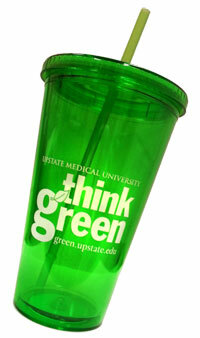 This program at Upstate alone will keep approximately 28,000 sharps containers out of the landfill each year. This initiative has also reduced overall costs of Sharps related expenses by 48% via a decrease in new container purchases and trash disposal fees. The environmental impact in the first eight months alone is staggering. It is estimated that over 62,270 pounds of plastic have already been kept out of landfills from this program alone! This number represents 14,936 pounds of plastic generated at the UH Community Campus and 47,335 pounds from the UH Downtown Campus. Additionally, the program is estimated to have prevented the release of 32,966 pounds of Carbon Dioxide (CO2) in 2014. Lastly, the program supports the Upstate Strategic Plan sustainability goal of continuously increasing our recycling efforts. In response to employee suggestions and in support of more sustainable practices, Upstate’s Annual Calendar is available online. Historically, thousands of color calendars were printed and distributed institutionally. 2016 marks the first year of a new method – electronic distribution, online availability, and limited hard copy calendars for the small population without computer access. According to John Farruggio, Benefits Manager within Human Resources, this new method has significant advantages. From a cost savings perspective, approximately $1,000 was saved in duplicating fees and distribution costs. Additionally, the timing and accuracy of the calendar is improved. The calendar, normally not available until the end of November, was finalized and posted in October because of the shortened completion process. Lastly, having the calendar electronically increases the likelihood of a current and accurate document. Changes can be made and uploaded in a short period, insuring constant access to the most current calendar. Kudos to all involved in this environmentally and fiscally friendly process improvement! The calendar is available at multiple locations, including the two most commonly visited sites: Payroll 2016 Upstate Calendar and Self-Serve. Over 1,000 bottles collected for Upstate’s ‘MEDICINE BOTTLES FOR MALAWI’ drive. "I am proud of our volunteers and staff," said Rhonda Butler, Volunteer Services manager. "While small, medicine bottles can make a huge difference in protecting the health of people in areas like Malawi, whose pharmacies and hospitals may not have the resources to provide adequate storage containers for medications." Thank you to all who contributed and Volunteer Services for coordinating! Holiday Coat Drive a Success! Greg Colella, EPIC HB Instructional Designer in IMT, believes in sustainability and in helping people. To do so this holiday season, he combined his passions and coordinated our first Think Green Coat Drive. In just two short weeks, Upstate’s generous members donated 129 new or gently used coats. The coats were donated to the local Rescue Mission specifically to the Outreach Department to be given directly to those in need. Extra kudos to Community Campus Clinical Engineering for gathering over 50 coats, Nursing Unit 5A for gathering 4 large boxes and 250 Harrison for 2 large bags! Kudos to the retail food vendors - Morrison and Espress Oasis - at Upstate Medical University for minimizing the use of Styrofoam. Most recently, Morrison has made significant strides to drastically reduce the use of Styrofoam in its retail locations. Specifically, they eliminated 2 sizes of plates, 3 sizes of bowls, and 3 sizes of cups within their cafeterias. 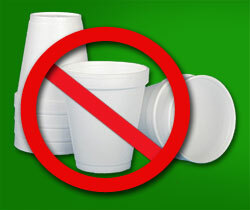 This amounts to approximately 1 million, three hundred and 16 thousand (1,316,000) pieces of Styrofoam a year! Financially, they will spend approximately $27,000 more a year to provide paper as opposed to Styrofoam. Espress Oasis at the University Hospital Downtown Campus has not used Styrofoam in several years. Both vendors participate in recycling and other sustainability practices. Thanks to all of our partners for responding to customer requests and supporting 'Green' practices! Upstate Medical University's downtown Syracuse residence hall, Geneva Tower, has received LEED Silver Certification from the U.S. Green Building Council. The high-rise facility, which features 139 apartments for students and medical residents, opened in 2012 following a $32 million renovation. LEED stands for Leadership in Energy and Environmental Design and is a green building certification program that recognizes best-in-class building strategies and practices. To qualify for the LEED Silver, Upstate had to achieve a certain number of credits that reflect cost and resource conservation in addition to promoting renewable, clean energy. 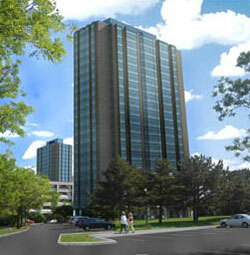 Upstate acquired Geneva Tower from the Empire State Development Corp. in 2010. At that time, the building was vacant and in need of repairs. A significant portion of the $32 million renovation included upgrades to the building’s windows, lighting and insulation, as well as heating, air conditioning and ventilation systems. "As Geneva Tower was an existing structure, implementing sustainable measures and high-efficiency systems was challenging at times," said Tom Pelis, assistant vice president for facilities and planning. "The design, construction and commissioning teams that worked together to achieve this goal deserve a round of applause. This is a wonderful achievement for Upstate and reflects its ongoing commitment to sustainability." 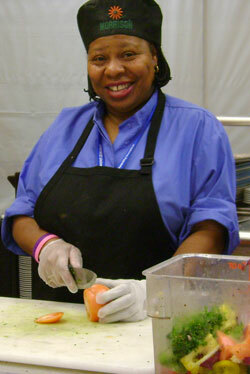 Morrison Healthcare food services employee Betty Stroman separates food scraps in an Upstate University Hospital kitchen. Food scraps are sent to the OCRRA Amboy Compost Site where they are processed into nutrient-rich compost that residents can purchase and use in their gardens and landscapes. The Onondaga County Resource Recovery Agency (OCRRA) lists Upstate University Hospital as one of the sustainability leaders in the community. That recognition by OCRRA is in no small part due to Upstate’s food composting project. By teaming up with its food service provider (Morrison Healthcare, a member of Compass Group) and OCRRA, Upstate has diverted more than 150,000 pounds of food scraps from the trash. Such sustainability efforts make sense. 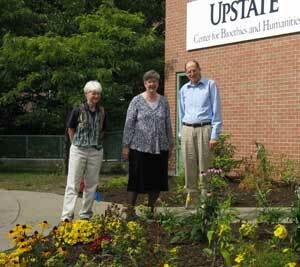 Upstate continually strives to improve their sustainability program. Adding food scrap separation was a logical avenue for the hospital to pursue. 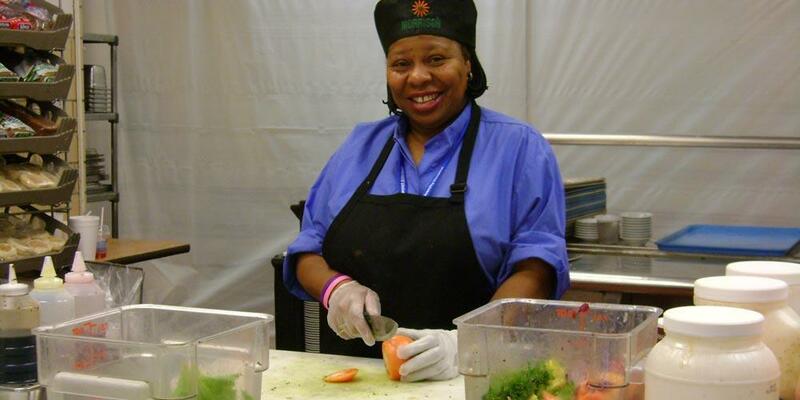 It helped the hospital and the food service vendor achieve their respective sustainability goals. The environmental services department bids out and awards the food waste pick up services to a local waste and recycling hauler, which transports the pre-consumer food scraps to OCRRA’s Amboy Compost Site in Camillus. 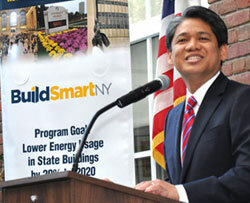 Gil C. Quiniones, president and chief executive officer of New York Power Authority announces a $21 million energy-efficiency initiative under way at Upstate Medical University that will save the academic medical center $1.3 million annually. Upstate Medical University has put the finishing touches on comprehensive energy projects that will reduce annual energy costs by more than a $1 million and remove several thousand tons of greenhouse gases from the atmosphere every year. The New York Power Authority announced the completion of energy efficient projects at two SUNY schools—Upstate and the University at Buffalo—late last year. The multimillion dollar upgrades were carried out under the governor’s Build Smart NY program, a comprehensive statewide initiative to increase energy efficiency in public buildings. "Upstate Medical University’s mission is to improve the health of the communities we serve," said Thomas Pelis, Upstate’s assistant vice president for facilities and management and chair of the university’s Sustainability Task Force. “With these energy-saving projects, we are supporting that mission through energy conservation and saving natural resources. We thank NYPA, NYSERDA and National Grid for making such improvements possible." "The NYPA-SUNY energy efficiency partnership has been extremely effective over the years in lowering energy bills at SUNY campuses throughout the state and in cutting carbon emissions," said Gil C. Quiniones, president and chief executive officer of NYPA. "The initiatives in Buffalo and Syracuse continue to support the important goals of Build Smart NY to lower energy consumption and reduce costs for taxpayers." SUNY Chancellor Nancy L. Zimpher recognized the efforts of both campuses. "Congratulations to the University at Buffalo and SUNY Upstate for achieving these pioneering projects, which will further drive the success of our strategic planning goal to support an energy-smart New York." The comprehensive array of energy efficiency improvements at Upstate include heating, ventilation and air-conditioning upgrades, interior and exterior lighting enhancements, boiler controls and hot water upgrades. In addition, the improvements feature a 50-kilowatt solar photovoltaic array, which is part of the Governor’s NY-Sun initiative to scale up solar deployment across the state. Construction on the energy efficiency project began in May 2012. The New York State Energy Research and Development Authority (NYSERDA) has provided a total of $1.1 million over the past several years to SUNY Upstate for various enhancements throughout the university’s campus, including $335,000 for the NYPA-implemented initiative. National Grid provided a $175,000 Custom Incentive award for high performance energy efficient lighting upgrades implemented at the east and west parking garages of the Upstate. Proceeds support a worthy cause: Your purchase supports Upstate’s Pediatric Pulmonary Sunshine Fund. The fund helps families of children with Cystic Fibrosis with medical needs not covered by insurance. It helps the environment: Your reusable cup eliminates single-use water bottles from landfills and saves you money on expensive bottled water! For more information on the program, please contact green@upstate.edu. 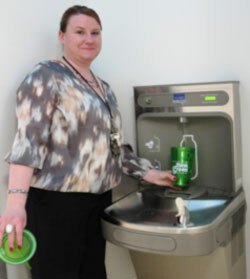 New filtered water stations are popping up all over campus. Lauren Wood, a PhD student in Microbiology & Immunology, and Eric Miller, a technician in the Department of Cell & Developmental Biology, fill their reusable water bottles from the "gooseneck" feature on the new units. 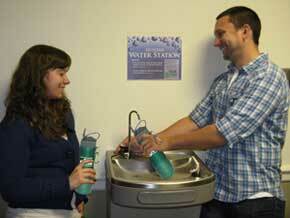 Filtered water is flowing through a growing number of drinking fountains on the Upstate campus. Physical Plant crews have been installing new water stations that deliver filtered water from a standard drinking spout and a vertical "gooseneck" element for filling reusable bottles. 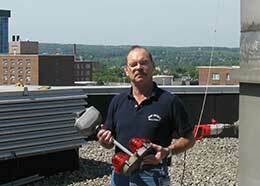 The new units are being installed in 10 buildings that previously did not have filtered water. University Hospital, the Weiskotten Hall Addition and the Gamma Knife Center already have filtered water. "In various locations around campus we are trying to provide sources of water equal to what is supplied by bottled water," said Gary Kittell, Physical Plant director. "The intent is to have water fountains with appropriate filtering systems in a limited number of locations in each campus building, to demonstrate their effectiveness and test customer satisfaction." The filtered water stations are identifiable by their distinctive gooseneck feature and by signs sporting the Upstate "Think Green" logo. If the new filtered water stations prove to be popular, additional units may be installed in various buildings, Kittell said. A sophisticated filtration system has been in place for many years in University Hospital and was updated in 2004. The Weiskotten Hall Addition's existing filtration system was improved that year as well. The Gamma Knife Center has had filtered water since it opened in 1998. Each new water station contains a carbon filter that reduces or removes odors and contaminants, and meets national standards for health and aesthetics. The water stations are part of the Upstate "Think Green" sustainability initiative, and help to support compliance with the Governor's Executive Order to halt the purchase of bottled water with state funds. Upstate's initiative to eliminate the use of bottled water to save money and reduce waste across the campus was recently highlighted in a syracuse.com article. Check it out >. The Center for Bioethics and Humanities has a new flower garden for its new home at 618 Irving Ave. Inspecting it are CBH faculty members Deirdre Neilen, PhD, associate professor; Kathy Faber-Langendoen, MD, founder and chair; and James Dwyer, PhD, associate professor. Think Green goes beyond saving energy. The staff at the Center for Bioethics and Humanities has taken "going green" literally, and they added other bright colors as well. They have planted a perennial garden in front of their new home, featuring low-maintenance plants that don't require a lot of water. A full complement of colorful flowers and other greenery will be on display in the spring. When SUNY Upstate's Center for Bioethics and Humanities moved into its new home at 618 Irving Ave. in July, the faculty and staff decided to spruce up the entranceway. "It was truly a collaborative effort," said Kathy Faber-Langendoen, MD, founder and chair of the center, housed in Upstate's former child care center next to University Hospital. On a weekend in August, CBH faculty, staff and family members pitched in to weed, dig, transplant and water. 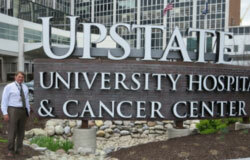 Upstate's Physical Plant supplied wood chips, and this fall will donate and plant a tree in the garden. "These are low-water, low-maintenance flowers," Faber-Langendoen said as she looked over the garden, which graces both sides of the CBH's entrance. "This gets full southern exposure, so it has to be hardy stuff." For now, the garden boasts black-eyed Susan's, mums, butterfly bushes, day lilies, viburnum and other flowering plants, as well as ornamental grasses. This fall, the green thumbs from the CBH will plant bulbs so that next spring, the garden will be ablaze with tulips and daffodils in addition to the colors already on display. "There's a lot of art inside this beautiful space we have," Faber-Langendoen said of the CBH's new home. "The garden is just a continuation of that beauty." The Center for Bioethics and Humanities, founded in 2000, strives to advance the understanding of bioethics and the medical humanities, and to promote clinical health care and health policy that is patient-centered, compassionate, and just. It does this through education, scholarly work and clinical services. For more information, go to Center for Bioethics and Humanities website. Ric Burr, an electrician at the Institute for Human Performance, holds one of the new lighting units that have replaced costlier bulbs on the stacks above the IHP. Here's a money-saving idea that truly started when a light bulb went … off. More than a year ago Gary Kittell, associate vice president for Physical Plant Services, asked employees to think about how Upstate could save energy and money on utility bills. Ric Burr, an electrician at the Institute for Human Performance, thought of the 20 incandescent 620-watt bulbs on the 10 stacks rising from the roof of the IHP, and how often they blew and had to be replaced – sometimes twice a year. And knowing how expensive incandescent bulbs are to power compared to LED (Light-Emitting Diodes) units, Burr investigated and learned the stack housings could be retrofitted with LEDs. "It just came to me," Burr said of his idea. "It just made sense." With the blessings of the Federal Aviation Administration, which regulates lighting on buildings and towers, Burr and his co-workers swapped out the 620-watt incandescents for 7-watt LEDs. The new units use 90 percent less energy, Burr said, and have a life span of 15-plus years. Buying and installing the LED lights with in-house labor cost $2,500, which will be recouped in six months, Kittell said.